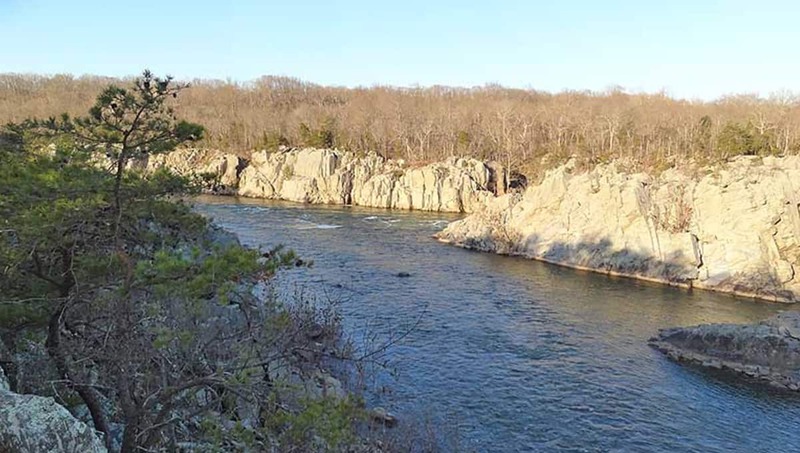 If you’re in or passing by Montgomery County, Maryland, and you’re a fan of hiking, you’ll want to check out Billy Goat Trail. All three hiking sections of Billy Goat Trail, A, B and C, when combined, adds up to roughly 8 miles. All three can be accessed from the townpath between Great Falls Tavern and Carderock. WHERE IS BILLY GOAT TRAIL? WHAT’S NEARBY TO THE BILLY GOAT TRAIL? While section A is a strenuous and technical hike, section B is challenging, leaving C section as a more casual and easy walk. Despite their differences, all three are equally beautiful, hosting gorgeous views of the Potomac River and they all begin and end at the C&O canal. In this article, we’ll outline everything you need to know about Billy Goat Trail: how to get there, which trail is best for you, how to prepare, and what to look out for. Billy Goat Trailhead is at 11710 MacArthur Blvd., in Potomac Maryland. From the parking area found at Great Falls Park, you’ll start by following the path past the Great Falls Tavern and Visitors Center. Remember you’ll need to pay $5 for this parking area, so make sure you bring change. Next, cross over to the C&O Canal at Lock 19 and follow the canal down to the Billy Goat A Trail entrance which is 50 yards in front of the Shop Gate. Alternatively, you can park across the street from the Old Angler’s Inn and walk down two hundred feet to the trailhead. While this option saves you from the parking scramble, you’ll need to walk about a mile down the C&O Canal when returning from the hike. If you don’t tire easily, this shouldn’t be a big deal since it’s a beautiful walk back, filled with herons, falcons, and hawks. Billy Goat A Trail is by far the most popular section to hike, however if you’re curious, the B section starts at the same parking lot, while the C portion uses the Carderock recreation area for parking and a starting point. Hours for the Billy Goat Trail are dawn until dusk. While the trail is crowded on beautiful days almost all-year long, you can escape the crowds by arriving before 8 AM. In this case, the early bird catches a bit of peace and quiet! If you’re one of those hikers who immediate become ravenous after a hearty hike, don’t worry. Old Angler’s has your back. Walkable from the parking lot, Old Angler’s Inn has an olden-day feel and is a popular spot for hikers due to its tasty lunch specials and cold beers. If you’re looking to treat yourself to something a bit fancier, L’Auberge Chez Francois on the Virginia side of the trail serves classic French dishes in a farmhouse setting. As a forewarning, you may feel a bit out of place stumbling into this upper-class restaurant after a 4-mile hike if you’re sweaty. However, if you’re one of those incredible creatures that hardly ever breaks a sweat and can look stunning in any type of workout gear, go for it! If you’re like most of us sweaty humans, however, you can check out Jacques Brasserie which is just across the road. This restaurant serves similar French food in a more casual setting. If you’re extremely sweaty or if you’re just looking for a big, dirty burger, check out the Old Brogue Irish Pub, which is a popular and cozy spot among hikers and locals. In general, Billy Goat trail is moderate in terms of difficulty, with challenging rock sections, depending on which section you choose (see more on this in the sections below). Since most people choose Billy Goat Trail A, we’ll be referring to this section more than the others. Billy Goat A is the most challenging and the most scenic out of the bunch. If you’re an experienced hiker, you may want to hop onto Billy Goat B section after you’re finished the A trail. This will elongate your hike for a bit more of a challenge. As mentioned, there are three circuits for the Billy Goat trail, all of which follow the cliffs rising above the C&O Canal. In this part of the article, we’ll outline what each trail section is like, so you can decide for yourself which one you’ll want to start off with. This section is the most popular for good reason. Billy Goat Trail A includes a challenging rock scramble area, colorful fall leaves following along the Potomac, and stunning views of Mather Gorge - all of which make for a winning hike. While this trail is fairly challenging, you’ll be exempt from a lot of elevation gain as it only reaches 280 feet. The only difficult part is making your way through the boulders. Taking this into consideration, you’ll want to come fully prepared with sturdy hiking boots or shoes that include solid ankle support. While this is a fantastic hike, the crowds may throw you off a bit. For a lot of the challenging rock scramble sections, you’ll practically need to wait in line. Also, besides the cliff section, overlooking the area, there won’t be many places where you can stop and soak up the surrounding nature. However, you may be able to find some vacant outcropping where you can stop to enjoy a packed lunch while flexing your Leave No Trace skills and packaging. However, the Potomac and waterfalls that come with it are undeniably worth it and you’ll walk away with a true sense of accomplishment, knowing you completed one of D.C.’s most beloved hikes. Also, due to its popularity, you’ll never have to worry about getting lost. An interesting point about this section is that you’ll be able to see the Potomac gradually transform from still and calm to dramatic and treacherous. After walking along the canal for a while, if you feel a need to learn more about its history, you’ll be able to stop by the Great Falls Tavern Visitor Center Museum after your hike. Billy Goat Trail A has been a well-loved trail for hikers for many years. It’s exciting, challenging, gorgeous and never seems to get old, no matter how many times you hike it. As the most demanding route on Billy Goat Trail, Section A provides a rocky and rough terrain, forcing hikers over huge boulders and along difficult paths. Trail A may be too difficult for first-time hikers or those with little hiking experience. At times, Potomac River is only 50 feet below Billy Goat Trail A, so hikers should be extremely cautious when navigating themselves around these areas. Also, many parts of the trail are closed off for ecological restoration, so it can be easy to lose track of the trail signs. Many residents of DC who are familiar with the Billy Goat Trail tend to brag about finishing the famous Section A due to its challenging and rugged nature. While the Potomac vistas and exciting terrain make it popular, the other two trails, Billy Goat B and C can offer more subdued alternatives. While section A offers exciting scrambles and beauty, B and C hold the simple, and respectful, enjoyment of serenity. Now that you’ve learned basically everything you need to know about Billy Goat Trail, it’s time to get serious for a second. First off, bring water. Depending on the time of year, the sun can have its way with you, leaving you dehydrated before you even know it. Take as many water breaks as you need, and try to remind yourself and the people you’re with to take them often. Also, make sure you wear sturdy boost. The boulders and rocks can be challenging. However, no matter how great your hiking boots are, steer clear from cliff faces and slippery rocks. Although the trail is marked by blue blazes, you should bring your own map, just in case. Lastly, if you’re needing some last-minute goodies or help, check out the ranger station at the Great Falls Tavern Visitor Center where you’ll find picnic areas, a snack bar, and restrooms nearby. And that’s it! 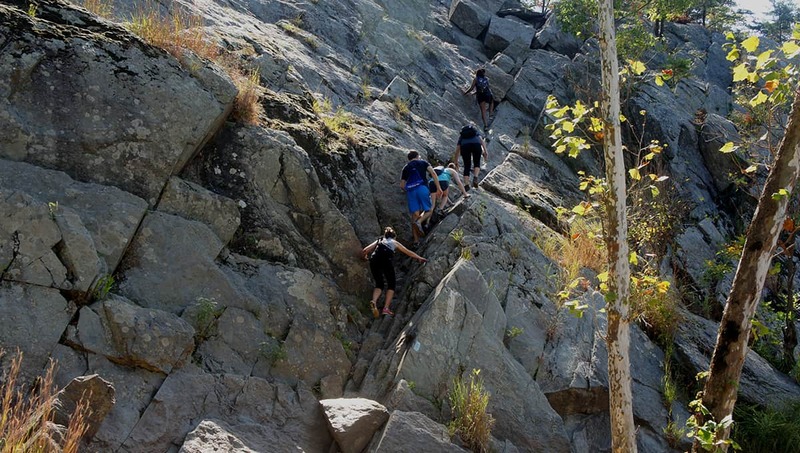 Consider yourself fully prepared to take on one of D.C.’s most famous (or infamous) hiking trails ​to earn bragging rights!